Hardly any feature is advertised as aggressively by smartphone manufacturers as the built-in camera, so we decided to dedicate an extensive review on this feature. With the Samsung Galaxy S9 and S9+, their motto is ‘Camera Reimagined’, and we all know by now that the Korean manufacturer isn’t known for its modesty. For our camera test we sent a Galaxy S9 to the Spreewald, a nature reserve near Berlin. We also sent a Galaxy S9+ to check out Malta. You can see the results for yourself in this article. But here’s one disclaimer before we get started: in our camera tests we used two devices of each model and none of them were equipped with the final firmware. So there could be some differences in image quality, but ordinarily, manufacturers don’t perform any miracles at this stage in the development. Let’s begin with the hardware: Samsung has actually given the camera in the Galaxy S9 and S9+ some new features. With a luminous intensity of f/1.5, the new flagship duo currently has the fastest aperture of all mobile phones. And apart from the Samsung W2018 reserved for the Asian market, the S9 and S9+ are the first smartphones to have a variable aperture. This means that the aperture ratio can be reduced to f/2.4 if required. But we’ll discuss that later in greater detail. Under the f/1.5 lens there’s a sensor that is not specified by Samsung. Compared to the Galaxy S8, the sensor has grown a bit (at least according to EXIF data), and the crop factor is now 6.05 instead of 6.19, which corresponds to an increase in area of about 4.65%. The resolution is still 12 megapixels. The Galaxy S9+ also has a second camera, the same module that Samsung uses in the Galaxy Note 8, with an f/2.4 aperture and 12 megapixels. Both the wide-angle and telemodule have an optical image stabilizer. As far as the hardware requirements are concerned, you can immerse yourself in the photos. In daylight, the Samsung Galaxy S9 and Galaxy S9+ deliver beautiful photos that look impressive, especially on the AMOLED displays of the devices themselves. On a color-calibrated monitor, however, I found the images supersaturated and they look extremely colorful. But apart from the saturation, the color rendering is sufficiently precise, but the image processing can also iron out the color nuances. The following photo looks pretty colorful, but the colors of the bananas and lemon were much further apart in reality. The same can be said for the following photo, in which we compared the same subject once with the Samsung Galaxy S9+ and once with the Apple iPhone X. The iPhone photo simply looks more natural. At the same time, the image processing of the Apple smartphone has become more round, and the details are evenly emphasized throughout the entire photo. Samsung, on the other hand, places greater emphasis on the details in some areas of the picture, but then irons them completely flat in others. And while we’re talking about lunch: the Galaxy S9 and S9+ feature a ‘food’ mode that has a prominent position in the camera app. The feature essentially adjust the colors a little: a pale yellow will turn into a crisp, rich gold. A blur at the edge of the image also directs the viewer’s focus to the plate, which ideally is placed in the center of the image. In terms of contrast, there are parallels to the color reproduction criticized above: on the smartphone display, the images look crisp, and on the computer they suddenly look strangely dull. The HDR mode likes to overdo it and produce a typically artificial HDR look. 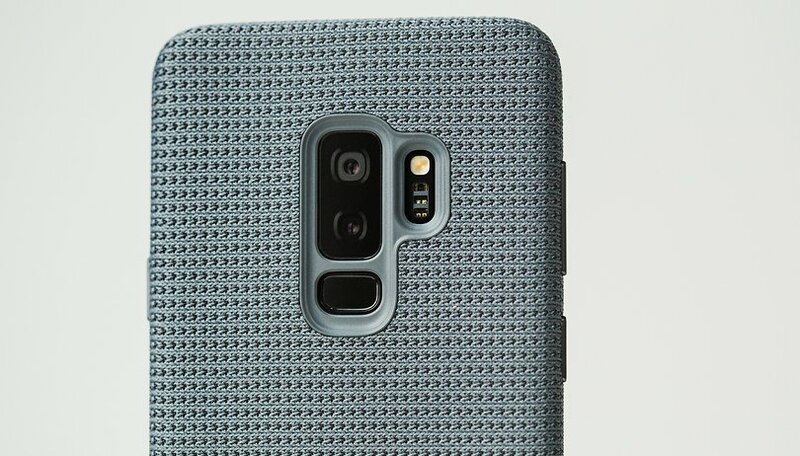 This can be seen in a direct comparison between the Galaxy S8 and S9, which often look very similar. With high contrast subjects, however, the S9 tends to fully extend its HDR capabilities. In my opinion, however, the Galaxy S9 wants too much from extremely high-contrast motifs, and tries to get all the details out of them. This can lead to unsightly effects, especially on large, bright surfaces. In the following photo, for example, most of the image is underexposed just to save the actually unimportant details in the lamp. This could have overexposed the electronics. Of course, this problem can be solved by adjusting the exposure compensation. But often you rely on the automatic system and don’t spend any time checking the photos you’ve just taken. The white balance of the Galaxy S9 and Galaxy S9+ occasionally tends to produce slightly reddish tints. This is particular noticeable in the various comparison photos with the Galaxy S8. The predecessor basically shot some more neutral photos, and the Galaxy S9 series often tends towards warm tones. With cloudy skies and a lot of sea in the picture, the S9+ colors the whole picture blue, including the stone fortress. What does the variable aperture in the Galaxy S9 and S9+ do? As soon as the new flagships detect more than about 100 lux, a small mask moves between the lens and the image sensor, shifting the aperture ratio from f/1.5 to f/2.4. 100 lux corresponds to the lighting typically found in corridors and stairwells in public buildings. But why does Samsung even bother? Because light is refracted to different degrees depending on the wavelength. To be more precise, the lower the aperture ratio of an optical system, the more strongly the lenses are curved. Towards the edge of the lenses, the angle of refraction increasingly differs from the angle of refraction in the center of the image, and as with a prism, the light is fanned out according to the wavelengths of the colors. This causes spherical and chromatic aberrations. The spherical aberrations cause blurring, especially towards the edge of the image, and the chromatic aberrations usually manifest in the form of violet and green color fringes at transitions with great differences in brightness. The complex optical correction of these effects usually also plays an important role in the price of the camera lenses. On the other hand, the tiny sensors in smartphones are still a good reason to install high-intensity optics. In low lighting conditions, the negative influence that high ISO sensitivities has on image quality is greater than the negative influence of a high-intensity lens. The difference between f/1.4 and f/2.4 is approximately one a half f-stops. This in turn usually allows the smartphone to shoot with ISO 1250 instead of ISO 3200, which significantly reduces noise. In daylight, however, even a small sensor gets enough light, and the problematic peripheral regions of the lens are eliminated by dimming to f/2.4. As the preceding photo shows, this is really effective: the reproduction of details is much better at f/2.4 than at f/1.5, which is also noticeable in a direct comparison between the Galaxy S9 and Galaxy S8. On its predecessor, Samsung still used an f/1.7 aperture. In this case it’s also noticeable that despite better quality, the file size of JPEG images slightly shrinks. But does the f/1.5 aperture really revolutionize night vision? The short answer is no. The difference between f/1.5 and f/1.7 is about one third of one f-ship, or the difference between ISO 320 and ISO 250. You can use the Pro mode of your smartphone and simply take two photos with these sensitivities and compare the results on your computer. ISO 250 may look a little better, but it’s not quite a revolution. The advantage in direct comparison with a Galaxy S8 is correspondingly small. It is noticeable, however, that the Galaxy S9 and S9+ deliver very noise-free shots. According to Samsung, multi-frame noise reduction is said to have reduced image noise by 30 percent compared to the S8, but this may not be quantifiable. In practice, it turns out that the Galaxy S9 photos are actually very low-noise, but they also lose many details. In direct comparison with the iPhone X, for example, the Apple phone gets significantly more details, even if there is more noise. A very similar comparison can be made between the Galaxy S9 and Google Pixel 2 XL. With HDR+, the Google smartphone brings significantly more image noise to the photographs in the dark, but it also gets more details than the Samsung Galaxy S9, so I find the results from the Samsung device more natural in this case. The iPhone X creates an image that is noticeably too dark in this scenario. There’s another aspect to the extremely bright optics of the Galaxy S9 and S9+: we found comparatively more halo effects and dazzling spots in photos, especially in shots taken at night. These are problems that come with such extreme optics. To put it into perspective, Canon’s 50 mm lenses with apertures of f/1.8, f/1.4 and f/1.2 cost around $125, $330 and $1,350, so Samsung is treading into technologically challenging territory here. Besides all their promotion for the main camera, the selfie camera hardly plays a role in Samsung’s marketing strategy. Their priorities in development seem to be similarly aligned. The selfie camera on the Galaxy S9 takes nice pictures, but in terms of image quality, the main camera is clearly superior. The lower dynamic range is the first thing you’ll notice here. In daylight, selfies often struggle with overexposed areas in the image. The sky and sea in the background often appear completely in these selfies. As least Samsung reliably focuses on the person in front of the lens and exposes them correctly. In return, however, there is the same orderly color rendering of skin tones that the main camera offers. At the same time, however, the selfies on the computer also tend to appear exaggeratedly squeaky and colorful and tend to shift in the red direction. At least the colors might be a desired effect for Instagram, etc. Higher focal lengths are much better suited for portraits than wide-angle cameras typical of smartphones with a focal length of 24 to 28 millimeters in 35mm equivalent. Photos taken with a wide angle lens always have a slight fisheye effect on the photos, which can for example make a nose appear unnaturally large. Like the Galaxy Note 8, the Galaxy S9+ shoots beautiful portraits with the 52-millimeter snapshot. The bokeh effect also works well and is usually free of noticeable errors. Particularly in daylight, the pictures turn out really well, although the colors here are also borderline bright in a very Samsung-typical fashion. The Samsung Galaxy S9 and Galaxy S9+ each offer a 4K video mode. The image quality in daylight is excellent, although the videos are often a bit too reddish for our taste. Skin tones in particular like to drift off into the orange zone. The detail reproduction is pleasingly clear, but the sharpness of movement is limited. In poor lighting conditions, clear image noise becomes noticeable, resulting in unattractive posterization effects that mercilessly flatten details. The Image stabilization in video mode isn’t 100% convincing. The HTC U11 Plus was more convincing in the camera test. Although the stabilizer compensates for slight shocks quite well, it then repeatedly produces blurred areas in the image. The sound is one positive aspect about the videos. Different sound sources in front of and behind the camera can be assigned well, wind noise is only noticeable in stormy situations, and the sound is always pleasantly clear and well-balanced. Finally, there is a slow motion function that offers up to 960 frames per second in 1270 x 720 pixels, although only 0.2 seconds of recording time? Doesn’t this remind you of Sony? While the Japanese manufacturer has now made the leap to Full HD with the Xperia XZ2, Samsung has been working on the practicality of the high-speed feature with the Galaxy S9. Motion detection automatically triggers the high-speed feature as soon as the motion is registered in an image area defined by the user. In the following video you can see a compilation of different scenes, which we recorded with the Samsung Galaxy S9 and Galaxy S9+. Conclusion: The best smartphone camera? After our camera test it’s clear: the Galaxy S9 and Galaxy S9+ are certainly among the best camera smartphones on the market, but they can’t outshine their current competitors either. The sophisticated slow-motion function and the telecamera in the S9+ are nice add-ons, but aren’t really decisive selling points. All in all, the camera alone isn’t a reason to buy the Galaxy S9(+), and it’s also not a reason purchase another device instead. The photo and video quality is still good, but we couldn’t find the revolution that Samsung had announced. But who knows, maybe the new Huawei flagship, which will see the light of day in Paris on March 27th, will have a distinctly better camera. Rumor has it that one of the allegedly three new models is supposed to come with a triple camera. What do you think of the results from our camera test? Are you convinced that the Galaxy S9 is the best phone on the market right now? I compared it with me S8 Plus camera and boy I am not impressed! hi Stephan, thanks for great review of Samsung Galaxy S9 And S9 Plus Camera. Personally, if you are buying a smartphone, based on the camera, DON'T. Yes, considering, they amaze me how well they work, but, that being said, photography is about capturing the light data. To do that it would help if they would increase the physical size of the image sensor, instead of increasing the number of sensors, or the number of physical lenses. The problem with that, is the entire industry is still consumed with the thin is stylish garbage. Small batteries, small camera sensors. If you remember the Samsung Galaxy Zoom several years ago, they had the right idea. Larger sensor, retractable zoom lens, but, until the industry bulks up, I don't see that happening. For quick snapshots, I use my phone, for everything else, I use my d-SLR.